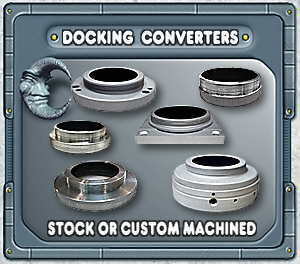 VSI can create any docking ring or adapter you need. If you don't see what you want listed, just give us a call. That's all it takes. The above left adapter (item AMT33, see below) was custom machined for a Televue NP-127 (3"-24tpi internal threads, above left, top thread) to replace his existing rack & pinion focuser with a [now discontinued] MasterGlide M3A focuser (3.25"-16tpi external threads, above left, bottom thread). This allowed use of our autofocus feature without the hassle of trying to convert the existing focuser to autofocus, just to find that the step ratio was too coarse to achieve sharp focus with a CCD camera - OOPS!. Since the client was using the M3A as a primary focuser, he used our 6" Drawtube (item DT6, see ACCESSORIES link above right) to obtain 5" of overall focus range, 1" from the M3A and 4" from the drawtube. The above right docking ring was custom machined to switch a client's M3A from his Meade SCT to his second scope, a Takahashi refractor (72mm-1mm thread pitch). Anything is possible! Meade 4"-16tpi Female to Meade 3.25"-16tpi Male Docking Ring Converter, Item ACR43 (above left): This D-ring converter is designed to screw onto the Meade 16" LX200 Schmidt-Cassegrain scope's 4"-16tpi male threaded visual back so you can dock a TOADLOADER, or any other 3.25"-16tpi Meade standard accessory on your 16" Meade SCT. At last check, Meade did not offer this accessory and said they had no plans for offering one either. Celestron to Meade Docking Ring Converter, Item AMC33 (above right): This 3.29"-16tpi female to 3.25"-16tpi male threaded converter is used to convert your larger 3.29" Celestron (C11 or C14) threaded visual back to Meade's smaller 3.25" threaded visual back format. Televue 3"-24tpi to 3.25"-16tpi Docking Ring Converter, Item AMT33 (below): This Televue 3"-24tpi female to 3.25"-16tpi male threaded converter is used to replace your existing Televue focuser with a 2" TOADLOADER (see Custom Machined Docking Ring Converters above for more info). NOTE: For production considerations, all 2" TOADLOADER Docking Focusers have the more popular Meade thread cut into their housings which, unfortunately, requires all Celestron owners to purchase this [unwarranted] converter. This is actually not Celestron's fault, it is Meade's fault for not conforming to the existing 3.29" standard that Celestron had already established in the early days of SCTs. Sorry for the "inconvenience!" 4" Square Base Plate to 3.25"-16tpi Male Threaded Docking Plate Converter for Newts and Dobs, Item ANT43 (above): This square, flat-bottomed, bolt-on converter includes mounting hardware, and is designed for easy installation on all Newts and Dobs. 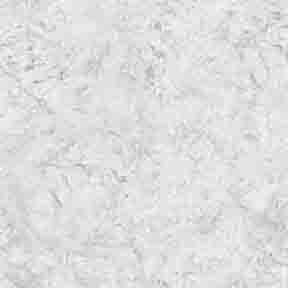 Universal mounting plate has flat base so you can fabricate a curved, flush mounting from soft materials (i.e. wood, plastic, foam, etc.) to easily flush mount the ANT43 to your scope. Or, if your scope has a flat mounting plate, all you need to do is drill four holes and mount the plate. Then simply screw your 2" TOADLOADER (model of your choice) onto your existing Newt or Dob scope. Plate is 4" square with holes inset 5/16" from edges. NOTE: Since 2" TOADLOADERS have 1" of travel, you may want to purchase VSI's 6" Extension Drawtube (item DT-6, see Accessories link) to increase your range of focus to 4 or 5 inches. This may require you to move your primary mirror forward to increase back focus distance. 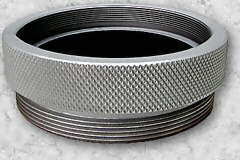 4.5" Round [flat-bottom] Base to 3.25"-16tpi Male Threaded Docking Ring Converter for Cassegrain and refractor telescopes, Item ACR45 (above): This round, flat-bottom, bolt-on converter includes mounting hardware and is designed for easy installation on all scopes that will accommodate this type of converter. Fully machined from a massive 1-inch thick cylinder of extruded 6061 aluminum. Mounting base angle is adjustable using push-pull set screws and Allen bolts. After you custom mount this converter, just screw your TOADLOADER (model of your choice) onto your scope. Radius from converter's center to mounting hole center is 2" (radius) and the 3 recessed [Allen bolt] holes are opposed by 120 degrees. NOTE: Since TOADLOADERS have 1" of travel, you may want to purchase VSI's 6" Extension Drawtube (item DT6, see Accessories link) to increase your range of focus to 4 or 5 inches.